While the star on most Persian tables is the scrumptious rice, no rice dish is accompanied without a meat based dish. 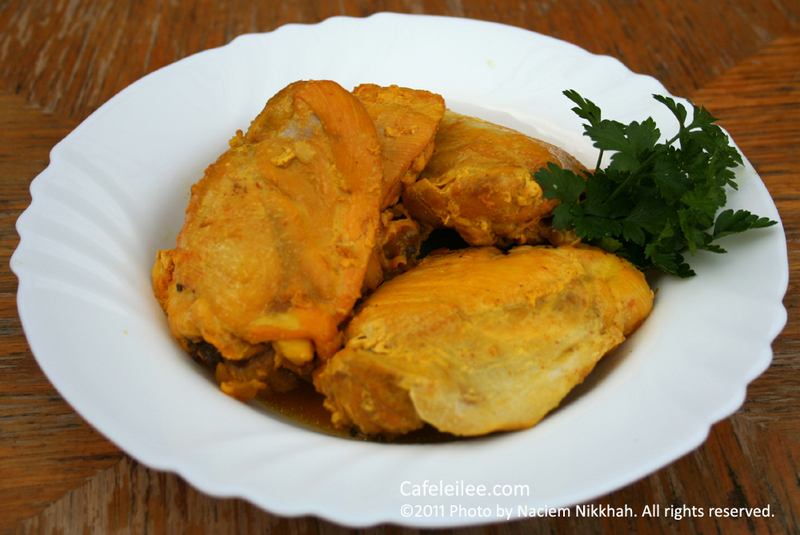 Chelow (plain rice) is usually accompanied by meat dishes in form of stews, however the rice dishes already mixed with herbs, vegetables, or fruits (polow) are complemented with simple meat dishes, like this saffron chicken. Add oil to a non-stick skillet over medium low heat. Season chicken pieces with salt and pepper and place them in the skillet along with the liquid saffron. Cover the skillet and let it come to a boil and cook for about 20 minutes, turning occasionally so that all sides get coated with saffron. Add lemon juice and let the chicken cook for 10 more minutes uncovered, until some of the liquid evaporates and the chicken absorbs more saffron color. Serve with your favorite rice dish. مرغ زعفرانی رو انقدر تو خونه کنار انواع پلو درست میکنیم که یادم نبود که دستورش رو از این زودتر پست کنم. هر کسی دستور خودش رو برای درست کردن مرغ زعفرانی داره، ولی من این دستور رو به خاطر راحت بودنش نسبت به بقیه ترجیح میدم. روغن را توی یک تابه نچسب بریزید و روی شعله متوسط تا کم بگذارد. مرغ ها را خوب نمک و فلفل بزنید و توی تابه قرار دهید. زعفران مایع را به مرغ اضافه کنید و در تابه را بگذارد تا جوش بیاید، بگذارد مرغ برای ۲۰ دقیقه بپزد هر چند وقت یک بار مرغ را بر گردانید تا همه جای مرغ زعفرانی شود. آب لیمو را به مرغ اضافه کنید و در تابه را بردارید تا آب مرغ کمی تبخیر شود و مرغ بیشتر رنگ زعفران را بگیرند. مرغ را با پلو مورد علاقه خود سرو کنید.